Do you ever find yourself stepping out into your backyard and thinking, “what are we missing?” If you think your backyard in Dubai is missing that special something, you have come to the right place! At Milestone we specialize in custom concrete swimming pool construction. Whether you seek an infinity pool, plunge pool, or anything in between, our team is passionate about designing and constructing a swimming pool that will turn your space into a little slice of paradise. As one of Dubai’s leading swimming pool contractors, We specialize in designing custom concrete pools, making them excellent additions to enhance your home’s outdoor living space, residential building, hotel, or school. 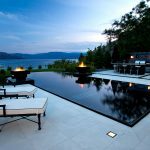 Our landscape designers create the highest caliber of uniquely designed pools. We are also prepared to compliment your pool with an assortment of water features and landscape elements that suit your desires and personal tastes. The professionals at Milestone will skillfully integrate these elements into your landscape designs, ensuring that your dream space becomes a tangible reality. On time, within budget, and hassle free: that’s the Milestone way! A skimmer pool does not have an overflow channel and a balance tank. These are the lowest price points for our custom pool designs. Water level is 15cms below ground level. They are very common when the space available is less or budget is smaller. Overflow pools are designed with an overflow channel and a balance tank to regulate the inflow of extra water into the channel and then into the tank. Water level is the same as the ground level. They look beautiful as you can see the water right on the ground. These pools seamlessly extend into the horizon for a very aesthetically pleasing and relaxing addition to any outdoor living area. They are raised above ground and appear as if they are disappearing in infinity into the lake or a sea. They are also raised as they make a beautiful water feature with a cascade when seen from the house. Provides a smaller deep swimming pool that’s specifically designed to refresh on a hot day! We can enhance your plunge pool with a waterfall or other exquisite water feature. They are mainly built to just relax and are smaller in size. These pools are narrow and long – maybe 2.7-3 meters wide and 15-30 meters in length to provide a nice length or those who love to swim as an exercise. The height of the pool is not deep and can be restricted to 1.3 m overall. A swimming pool is more than just a place to entertain and relax. In fact, there are numerous benefits to designing and building a custom pool. Owning a pool not only makes your property more appealing but it’s been shown to increases the value of your home by as much as 15%. If the time comes to move on, a custom swimming may be the difference between selling your home quickly and keeping it on the market for an extended period of time. Our custom tailored swimming pool design services are crafted and constructed to fit your needs! Your pool does not have to be so large that it dominates your entire landscape area, leaving you with little space to entertain. The Milestone swimming pool design team will create a design that meets your needs and compliments your lifestyle. Swimming pool construction will effortlessly compliment your landscape area and design theme. We will design and build a pool that is the perfect size and shape to make the most out your outdoor living space! When a pool is designed properly it becomes more than just a large tank of water in the back yard. The right pool will turn your garden into an elegant outdoor oasis. With waterfalls, vanishing edges and other unique amenities, a pool can serve as a relaxing and inviting centerpiece right in your backyard. Not only will your pool look amazing but your family will love it too! Your family will spend hours of time relaxing and swimming in your pool. You’ll make lasting memories as you teach your kids to swim, play with them in the pool, and barbecue by the water. What better way to entertain on those hot afternoons and warm summer evenings than in your custom designed swimming pool? Invite your friends and neighbors over for a poolside barbecue or a dip in the water. Your unique pool will be the envy of the neighborhood! It’s more than just a pool! Whether you have a concrete idea for your pool design or are looking for suggestions, our expert landscape designer team will work with you to design a luxury outdoor space you’ll enjoy for years to come. Whether you are seeking a skimmer pool, overflow pool, infinity pool, lap pool, vanishing edge pool, or edgeless pool, your landscape design and budget will define what pool best suites your needs. We can include water features, special effects, and landscape elements that will enhance your custom pool design to create an elegant outdoor oasis. Or, we can install the stand-alone in-ground pool that your beautiful landscape is missing. Whatever your needs, our design team is here to assist! Our expert swimming pool design team will take the time to reflect on your space, and together we will craft a design that meets every aspect of your pool design. We will determine how much deck space you really need for all those summer and fall parties, and how the style of the pool reflects that of the home itself. Do you want your pool to stand in isolation or act as more of a centerpiece for your outdoor living space? By the time we are finished you’ll be planning your next holiday at home! If you’re interested in adding a custom pool to your backyard or outdoor living space in Dubai, contact us to get the ball rolling. We’d love to start designing and building the pool of your dreams!